Room #4 The King Suite is on the second floor of the Manor House. 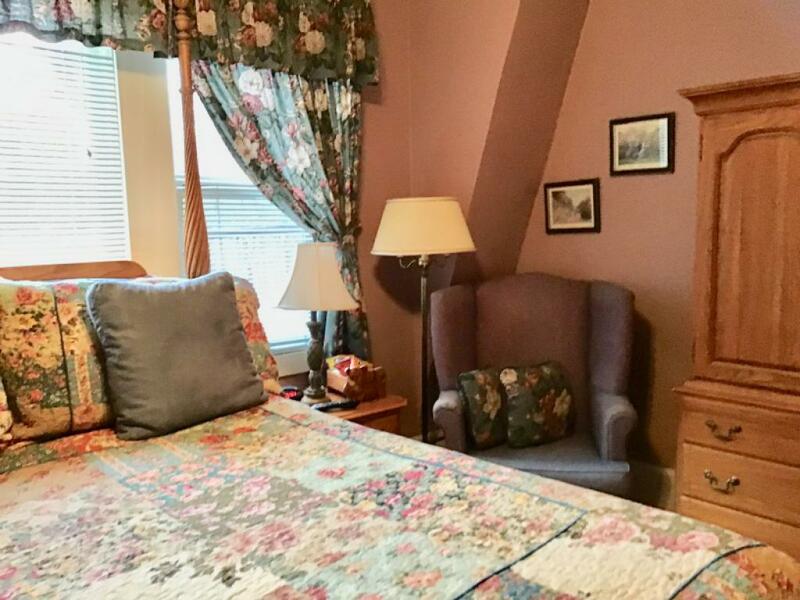 The Suite maintains a gracious classic design with its timeless elegance. 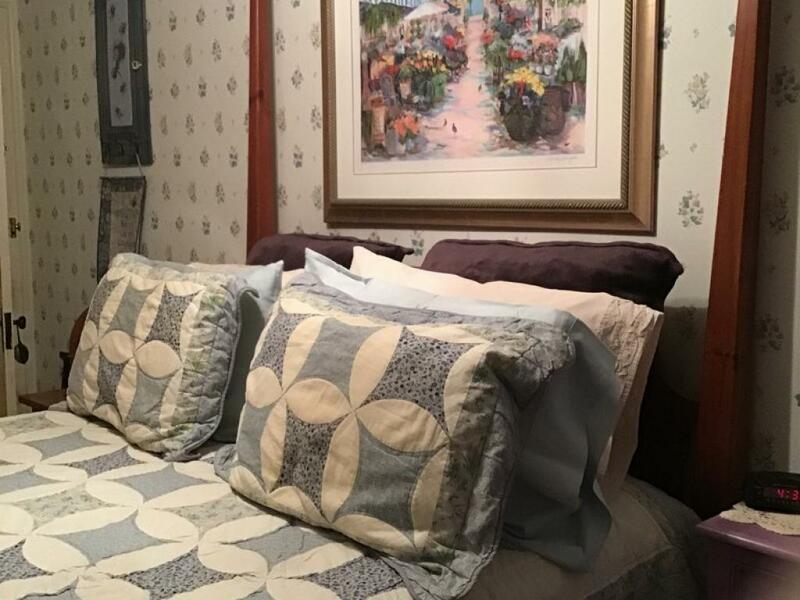 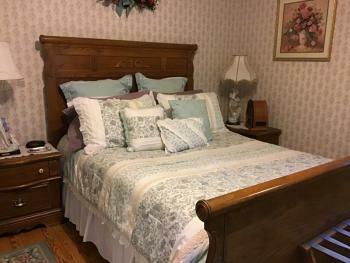 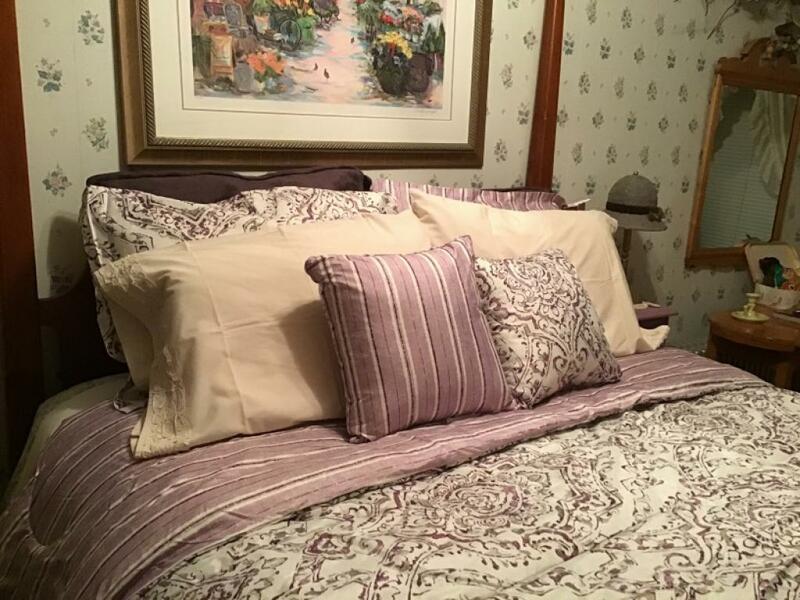 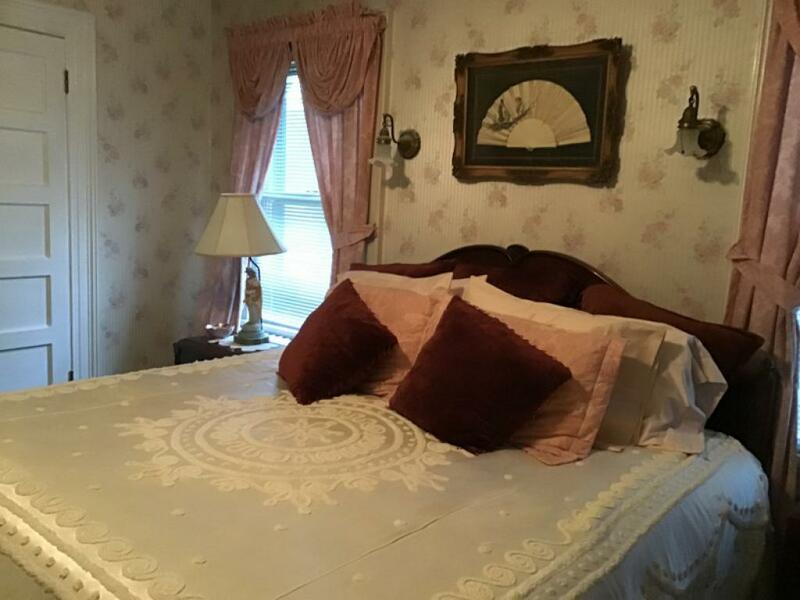 The large king bed is covered in an antique, satin bedspread and nestled within a cherry wood bed frame with nightstands topped with antique lamps. 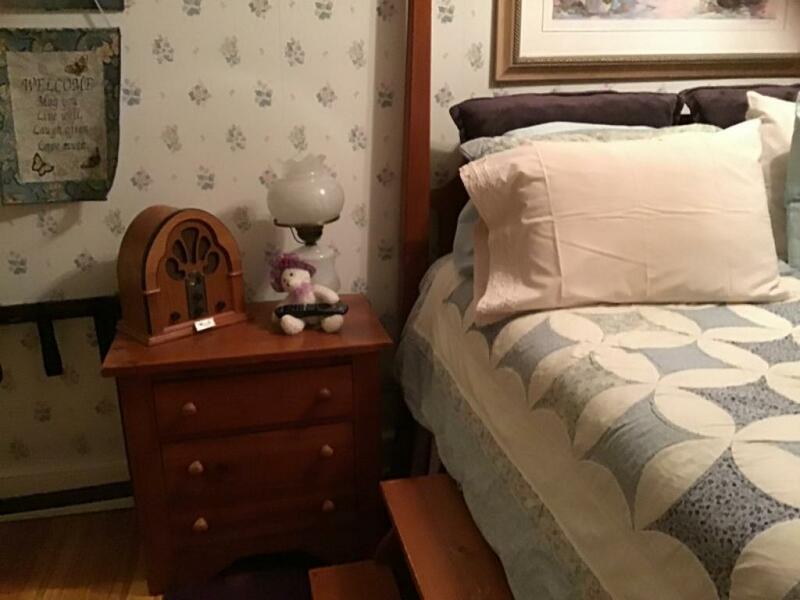 Family heirlooms are scattered around the room and date back to the 1800s. 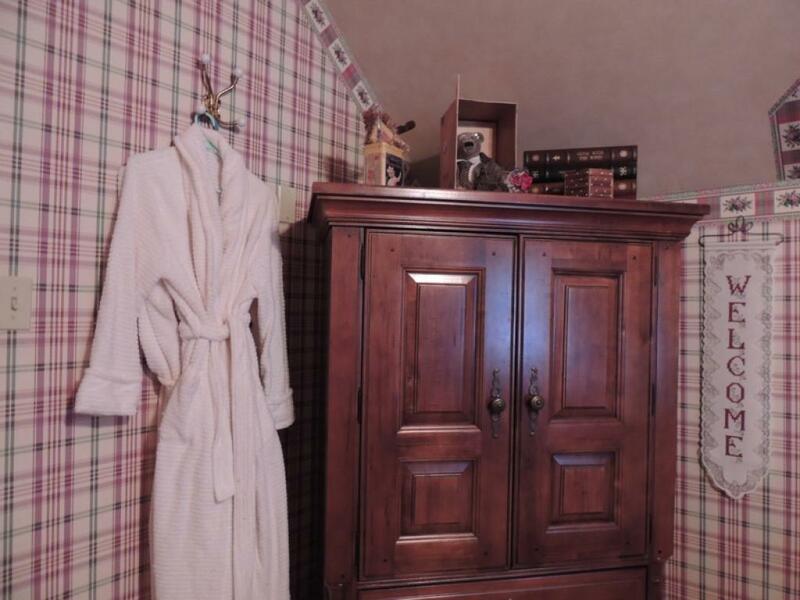 An oversize armoire, with a Flat Screen TV inside, triple dresser and Damask covered bench complete the bedroom ensemble. 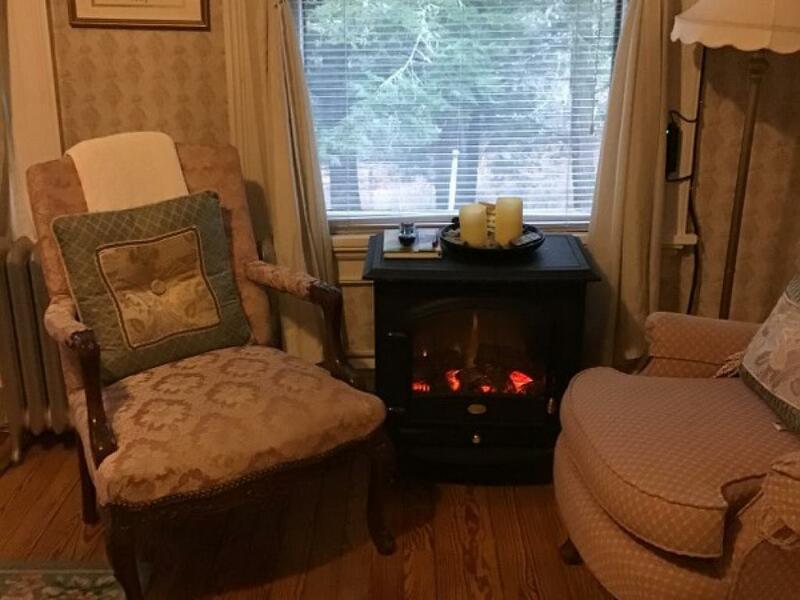 You can also relax in your country sitting room on one of its plush lounge chairs and ottomans while enjoying the dancing flames from your freestanding fireplace or watching your additional TV. 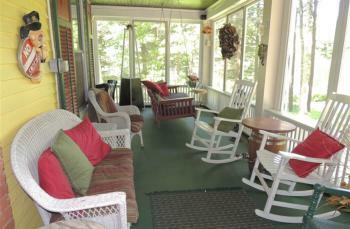 There is also a private porch with views of the forest. 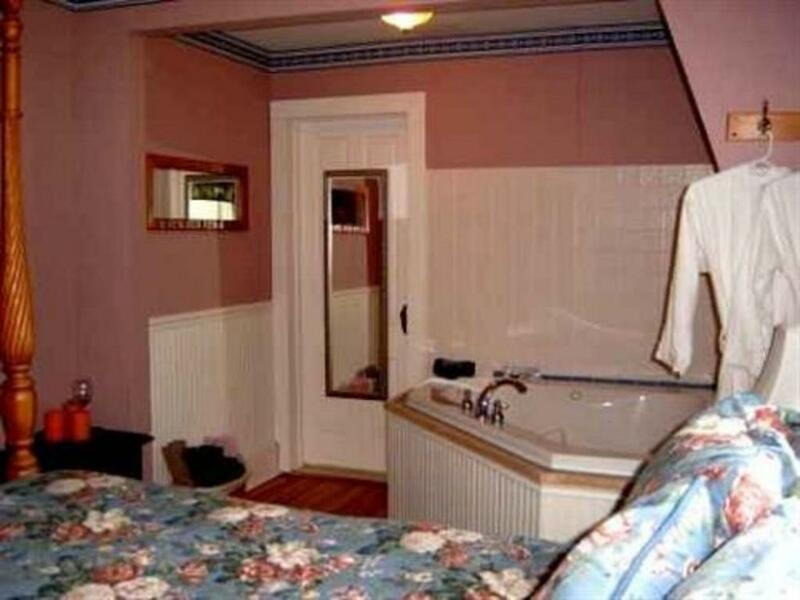 This room has a private bathroom with a tub and shower. Room #5 This warm and cozy room is on the third floor of the Manor House. 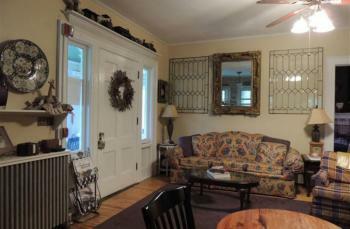 Enjoy the architectural charm of this room with its sloped ceilings and private sitting nook (with TV). 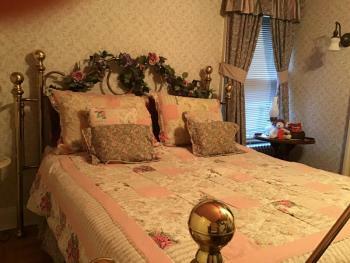 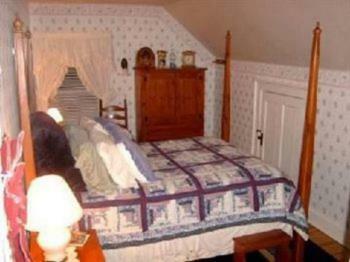 The room is decorated in a country style with a queen-size antique brass bed. 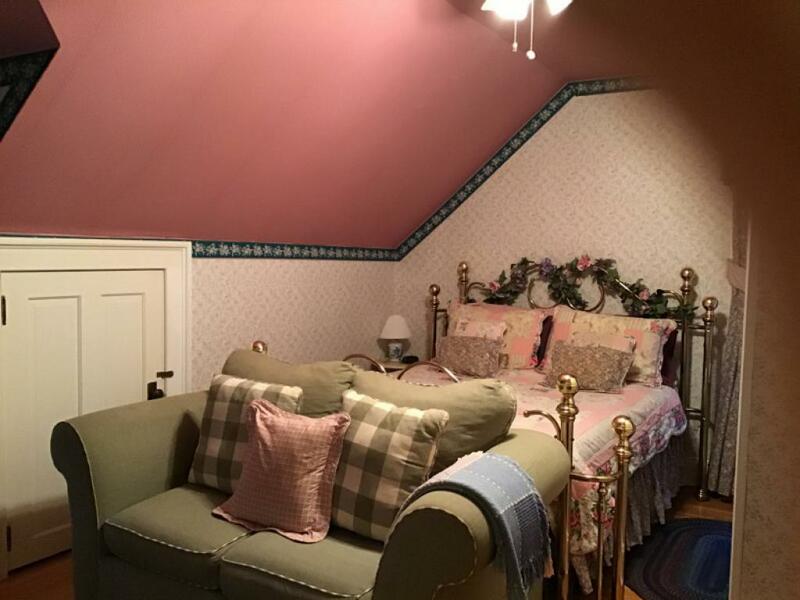 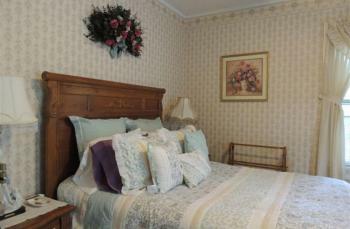 The pinks and greens of the wallpaper harmonize nicely with the country cozy quilt. 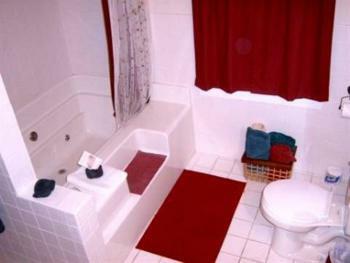 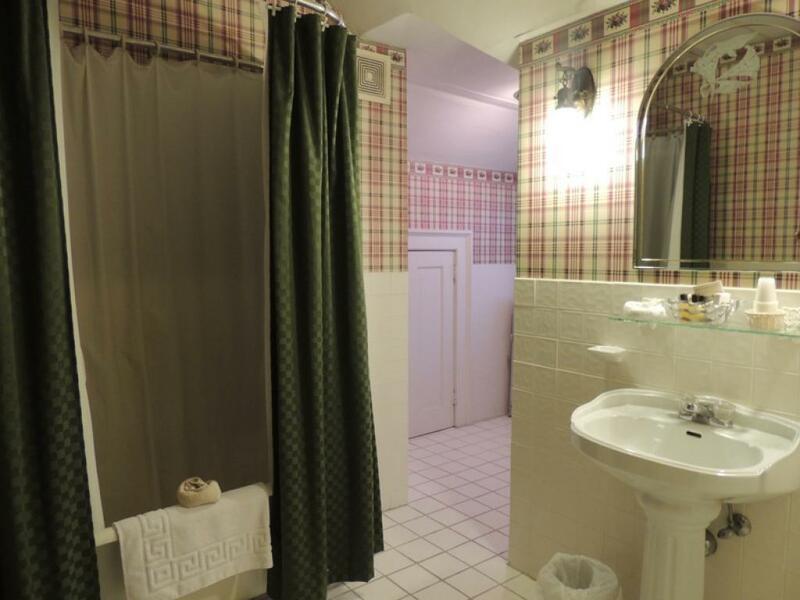 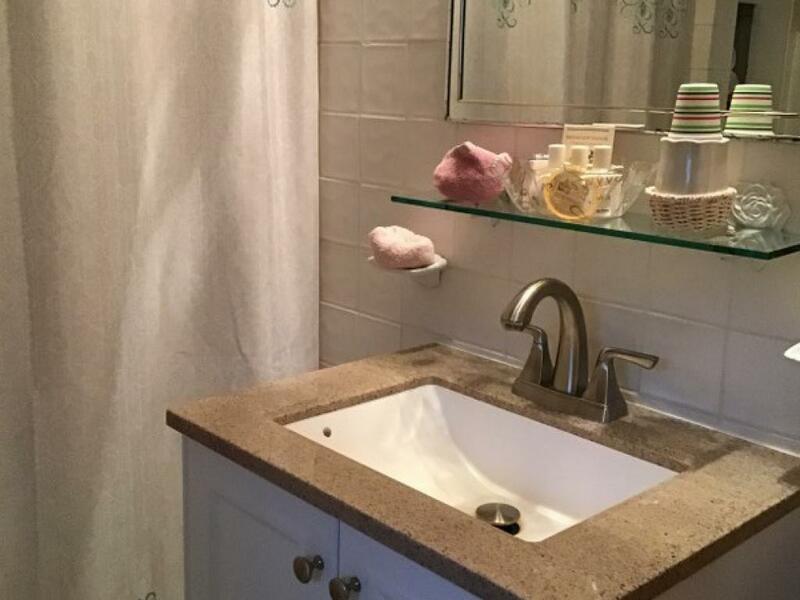 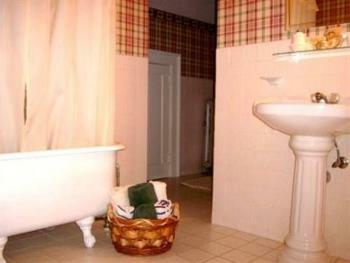 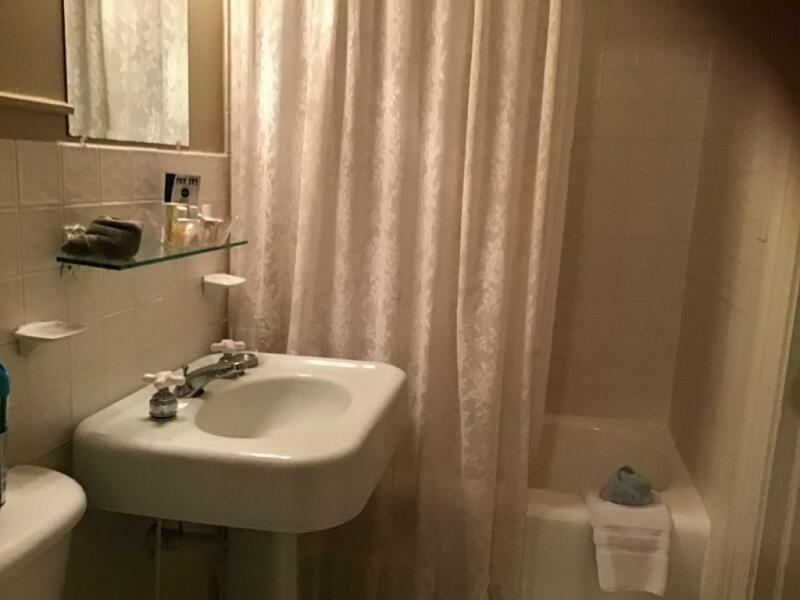 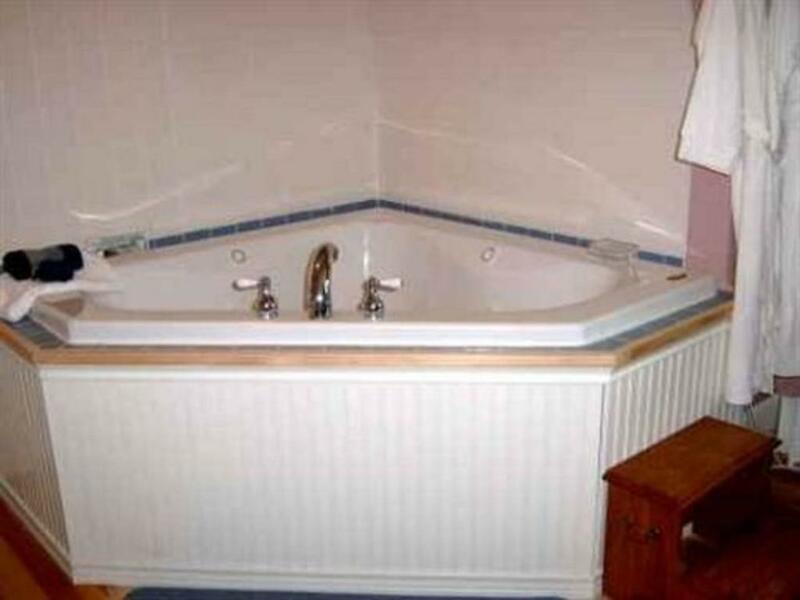 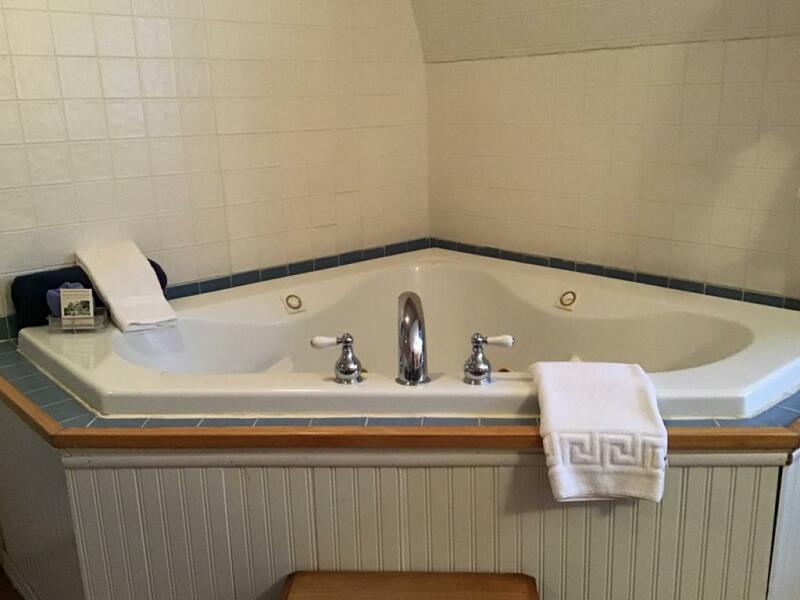 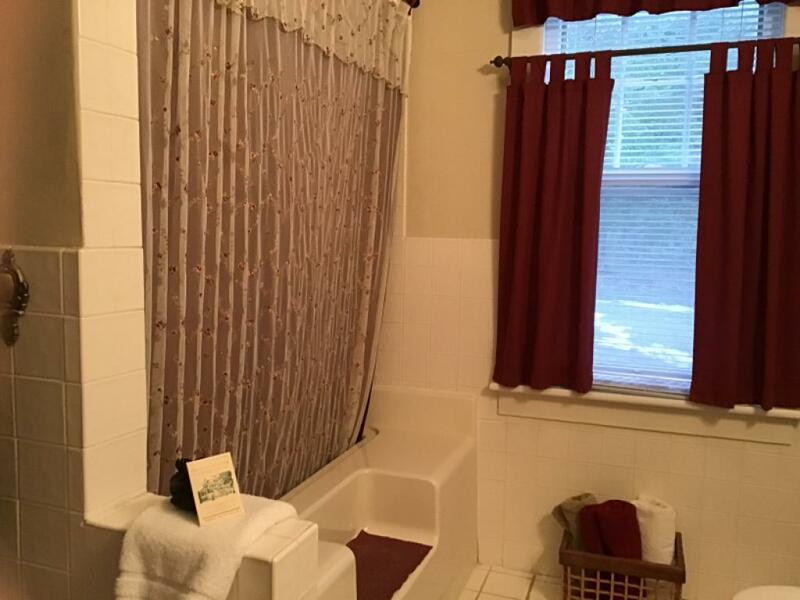 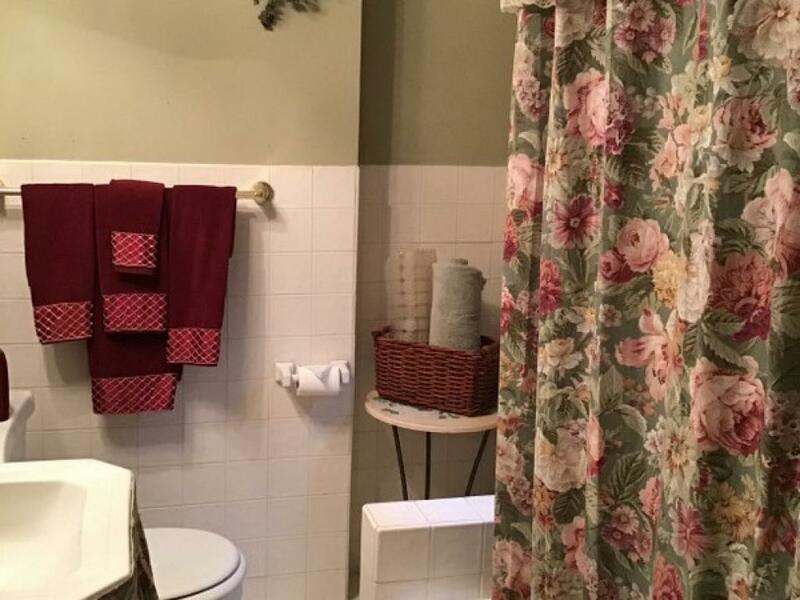 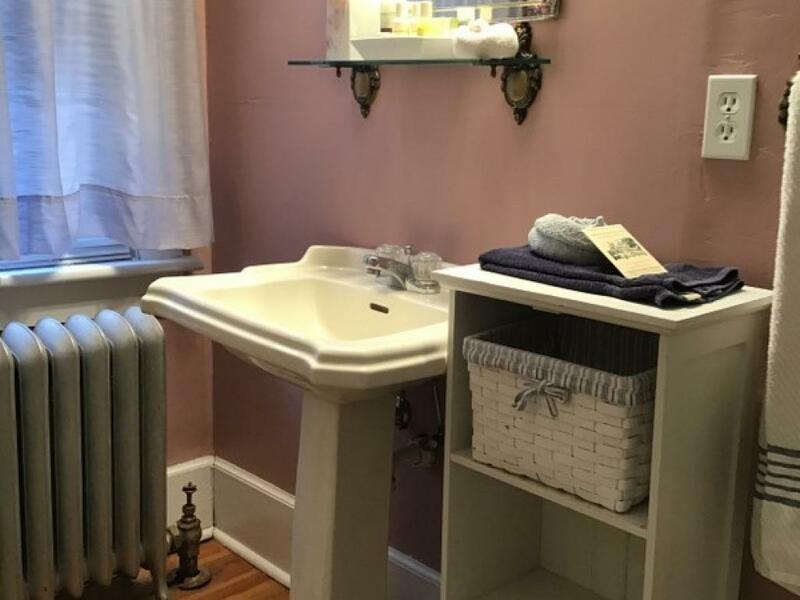 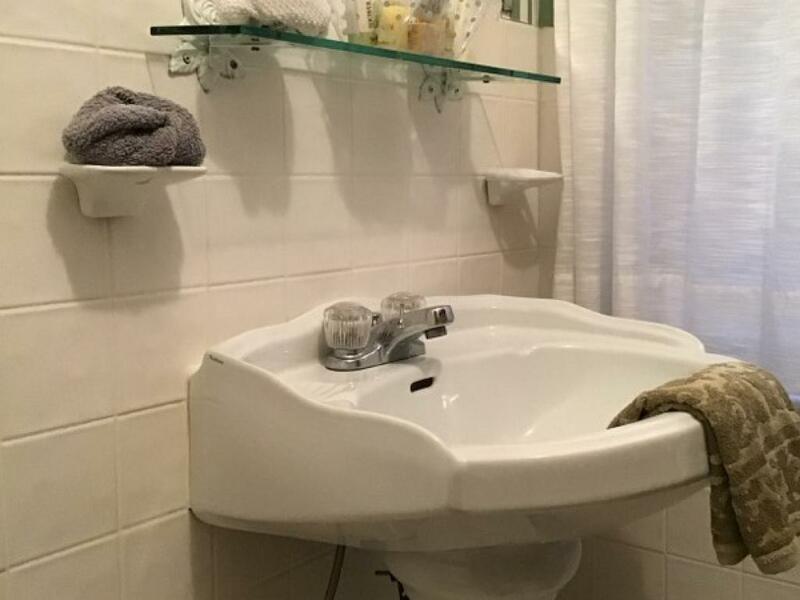 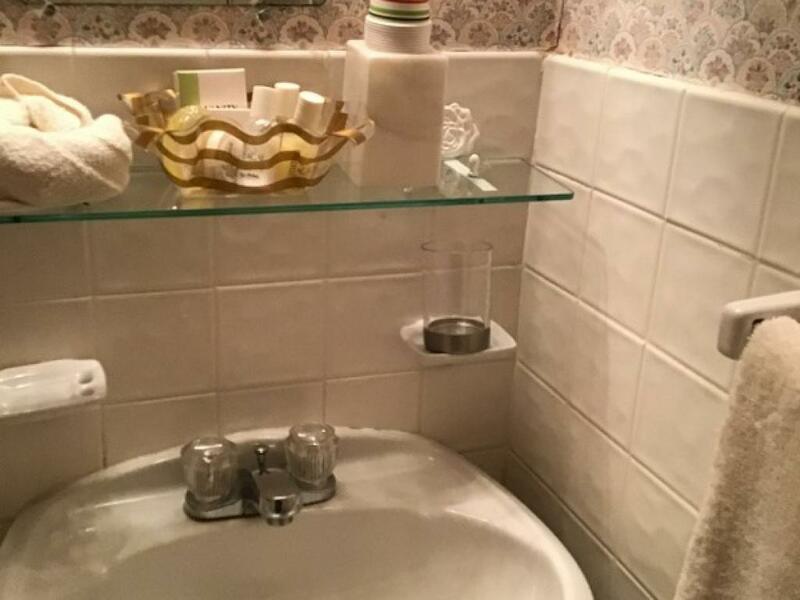 There is a large private bathroom with a tub and shower. The views from this room are of the forest and the front lawn. 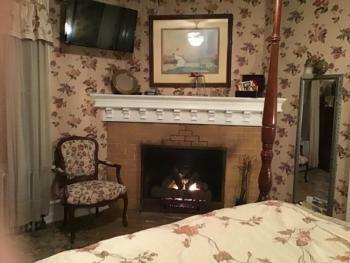 Room #3 The Fireplace Room is on the second floor of the Manor House. 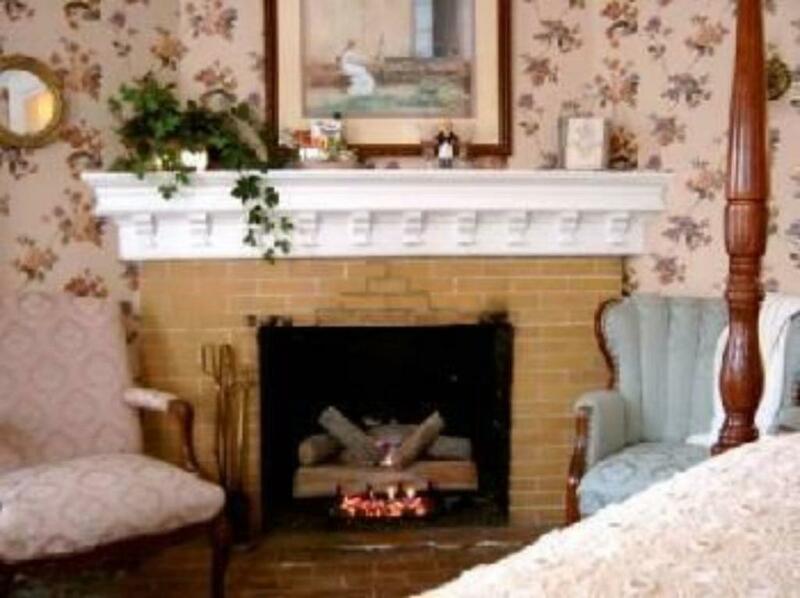 This romantic room boasts the original 1901 corner mantel fireplace. 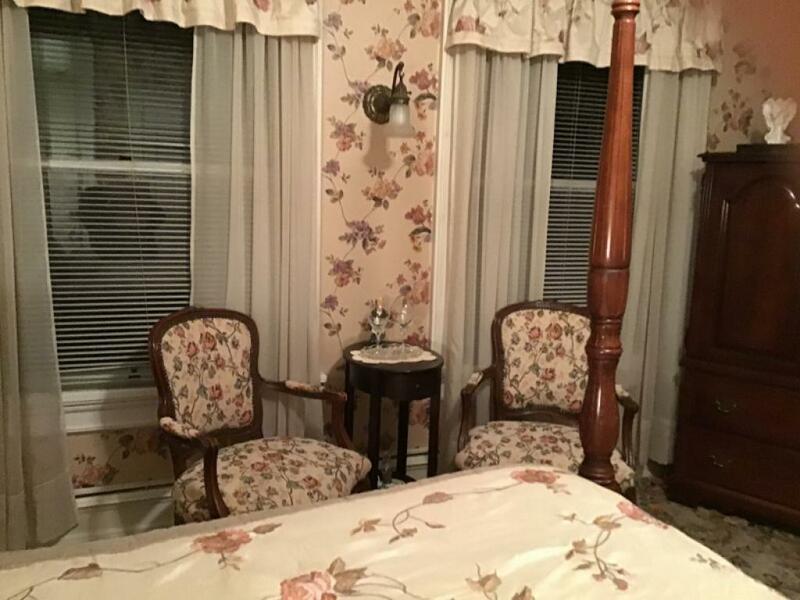 The high four-poster bed adds to the romance and charm of this room. 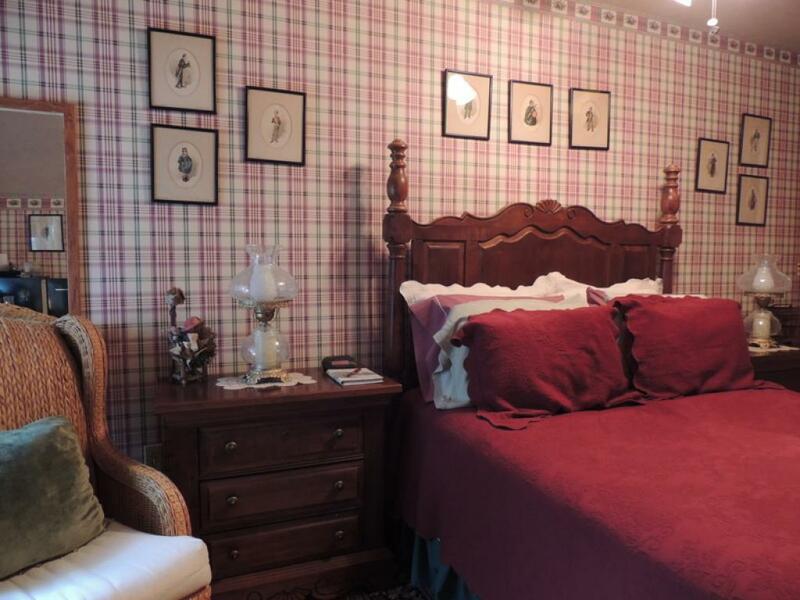 The dark cherry wood conveys a Georgian influence to the bed with matching nightstands, armoire and flat screen TV. 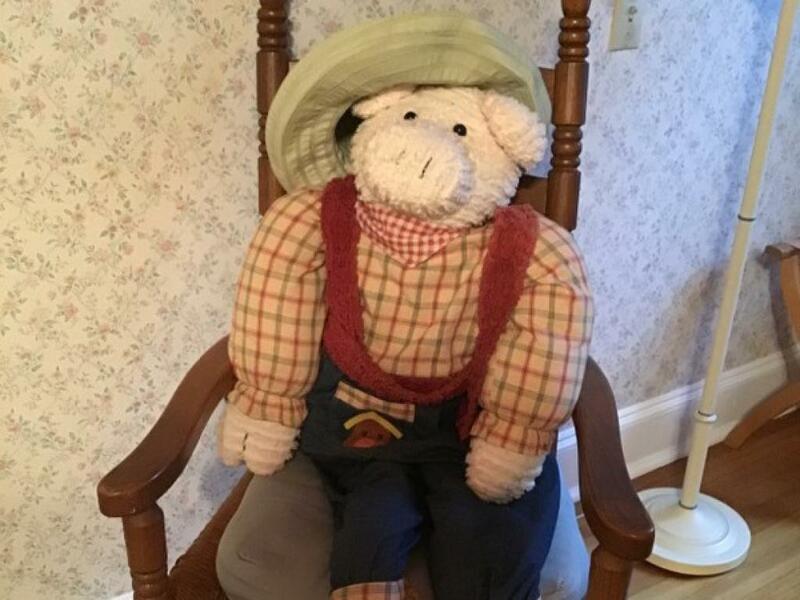 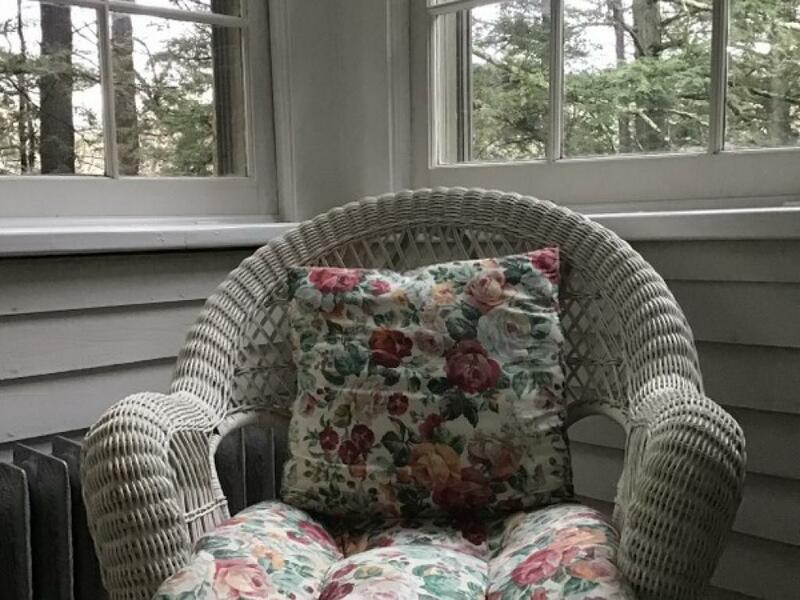 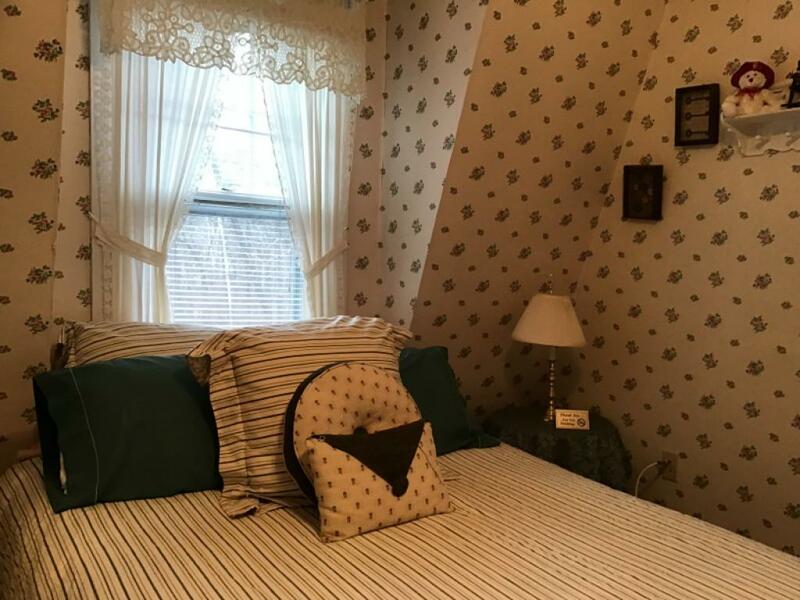 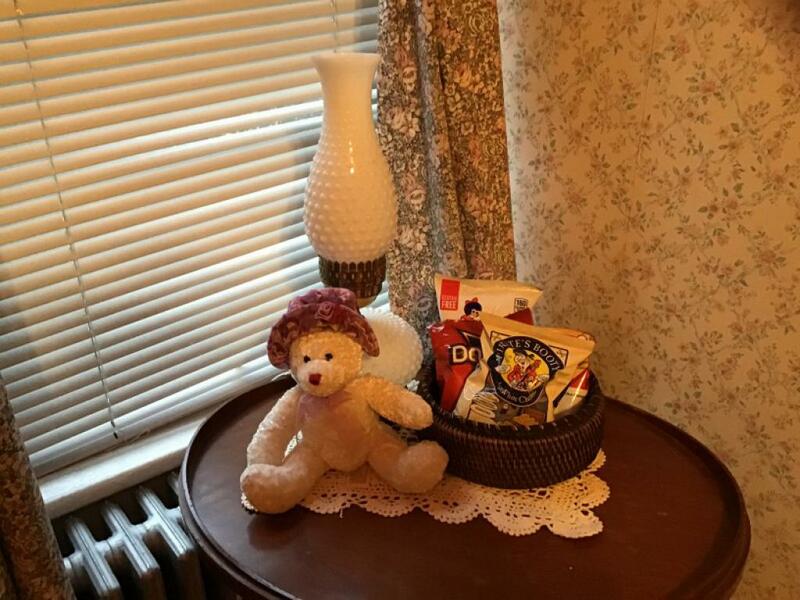 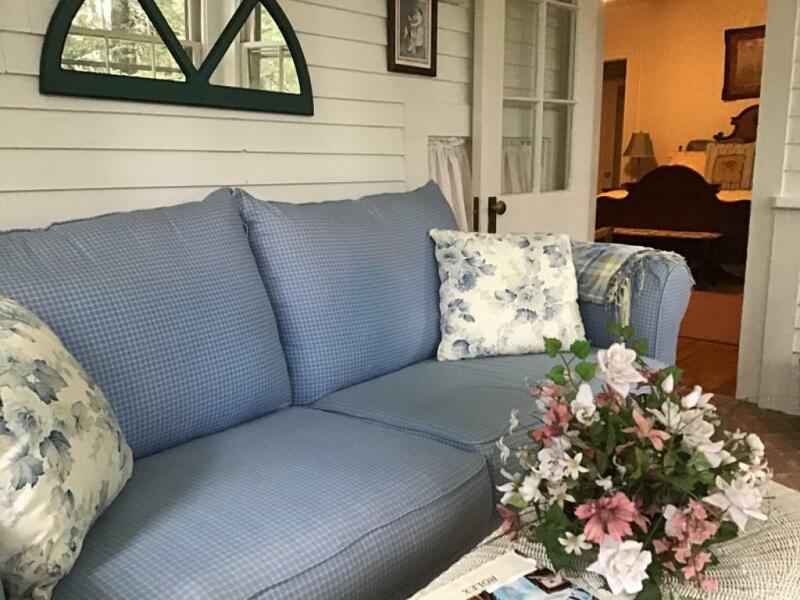 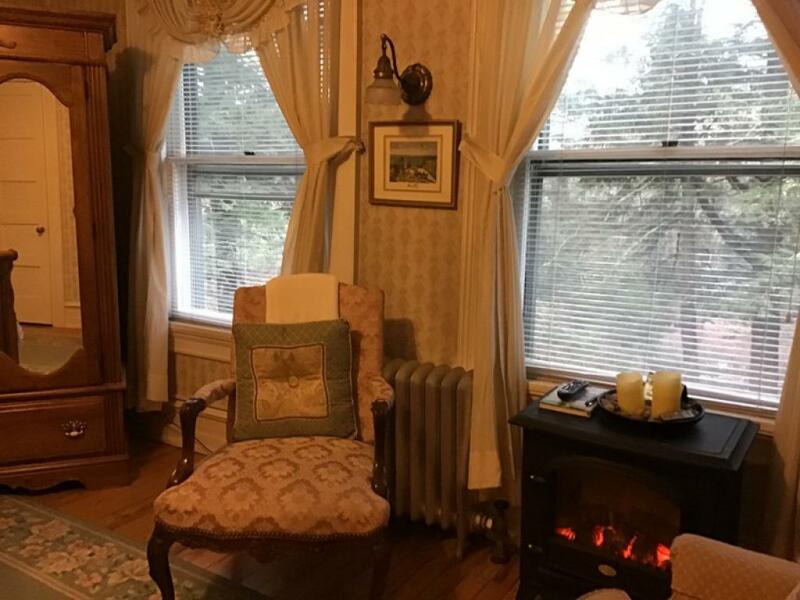 There is a cozy sitting area under the windows with antique needlepoint chairs to relax in and enjoy views of our lawns and the Brodhead Creek or just watch the dancing flames from your fireplace. 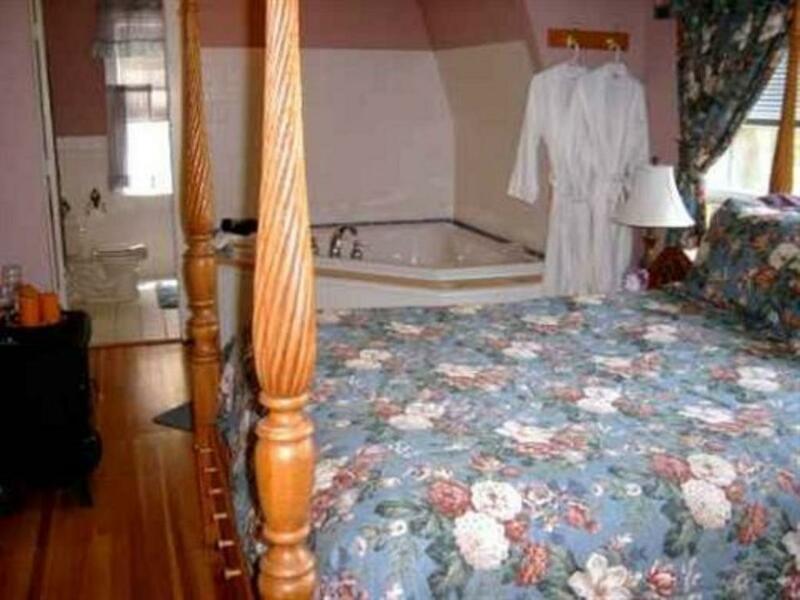 This room has a private Bathroom with a tub and shower. 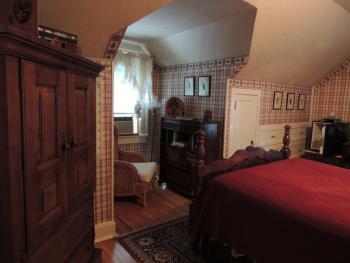 Room #2 is on the second floor of the Manor House. 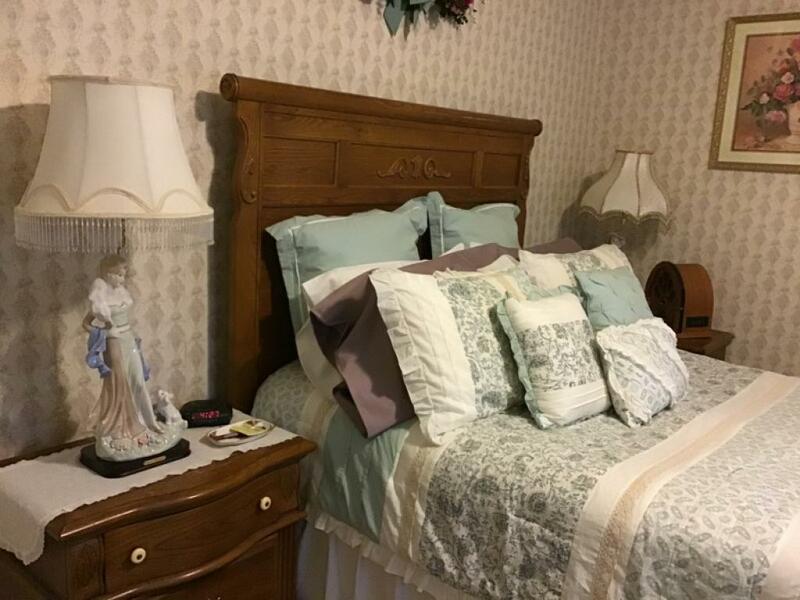 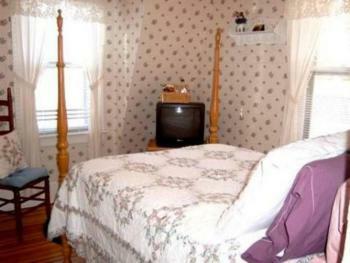 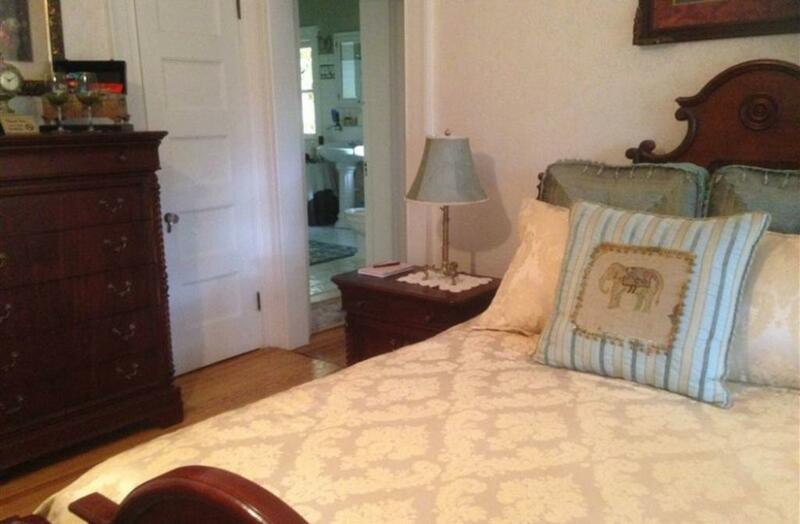 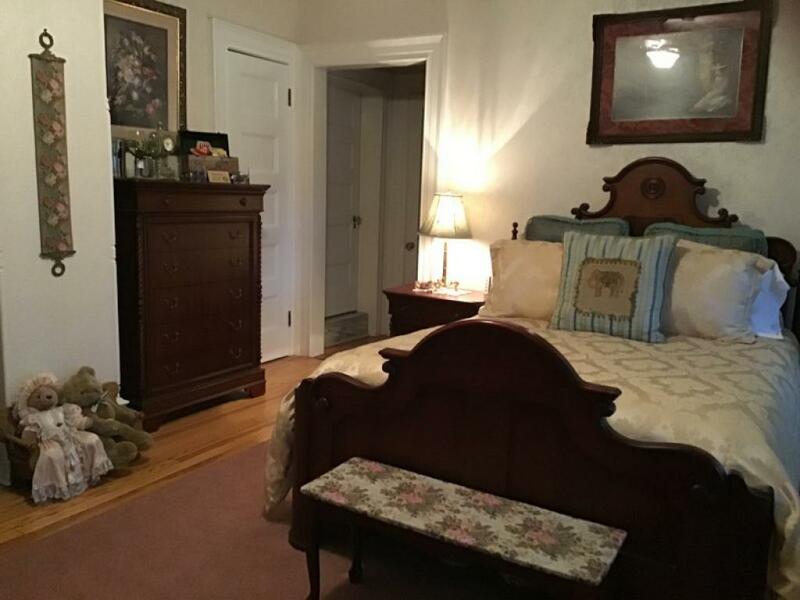 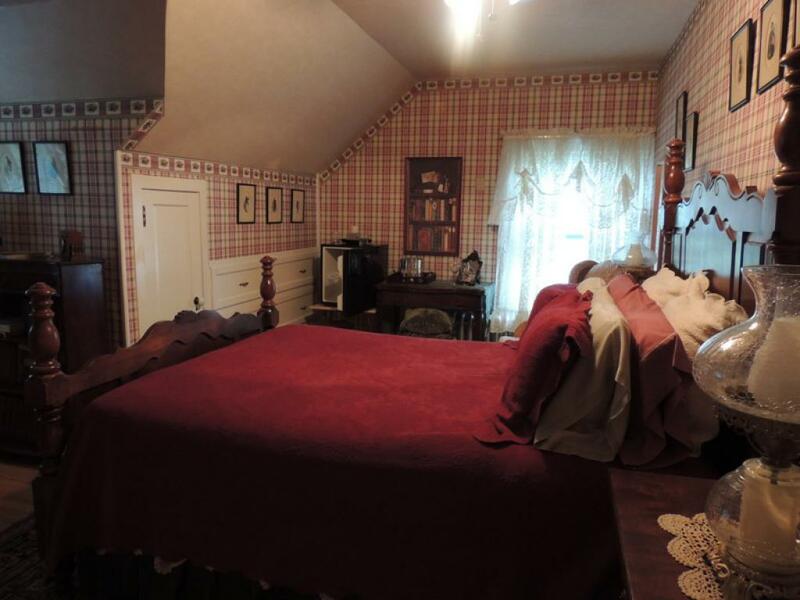 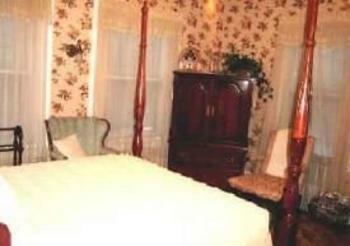 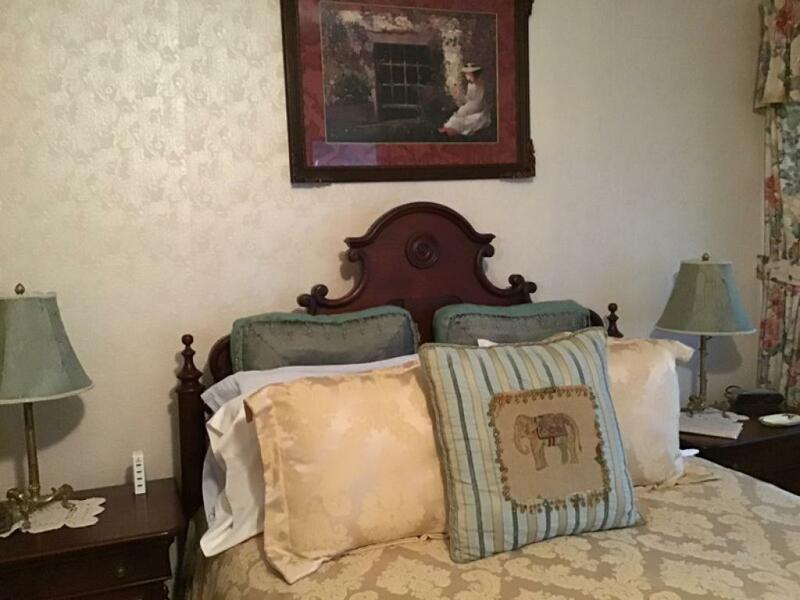 This room has a Victorian queen-size oak sleigh bed with matching nightstands and large armoire and a flat screen TV. 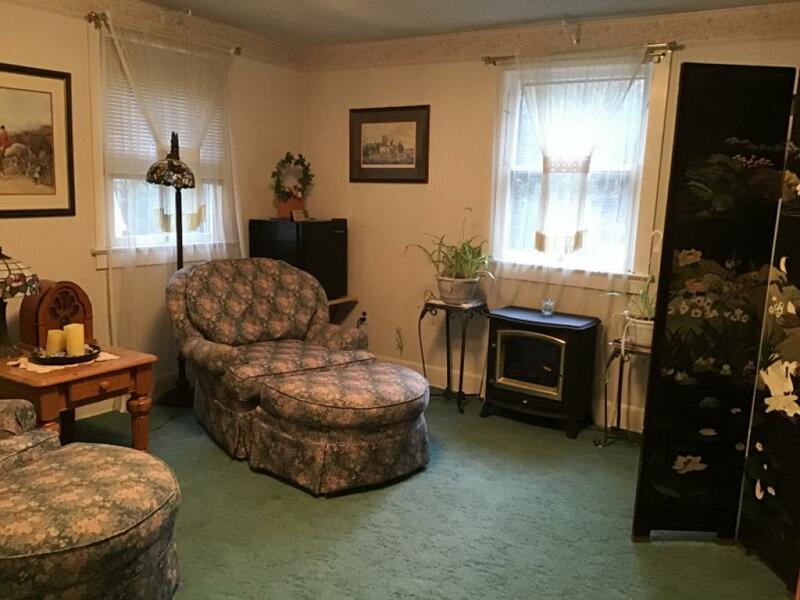 It has an inviting sitting area with a table and two large wing chairs that beckons you to relax and enjoy the views of the Brodhead Creek or the bouncing flames of the freestanding fireplace. 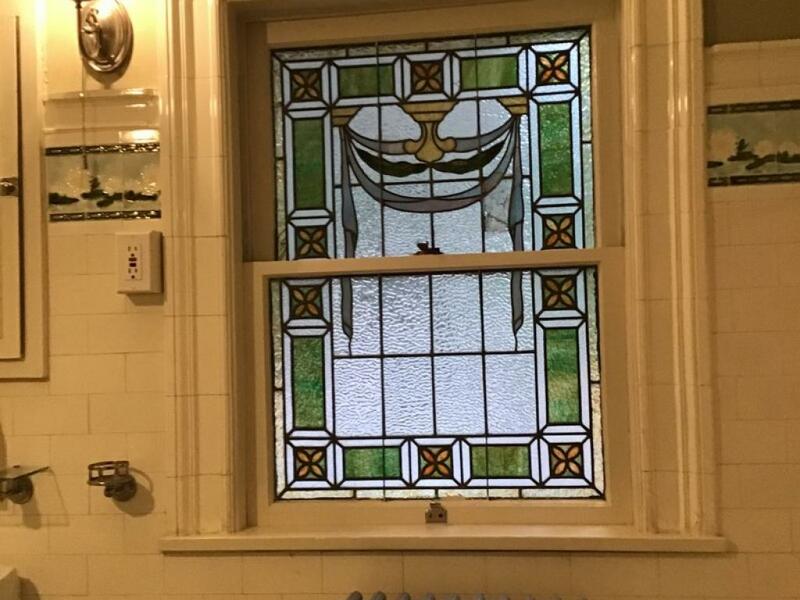 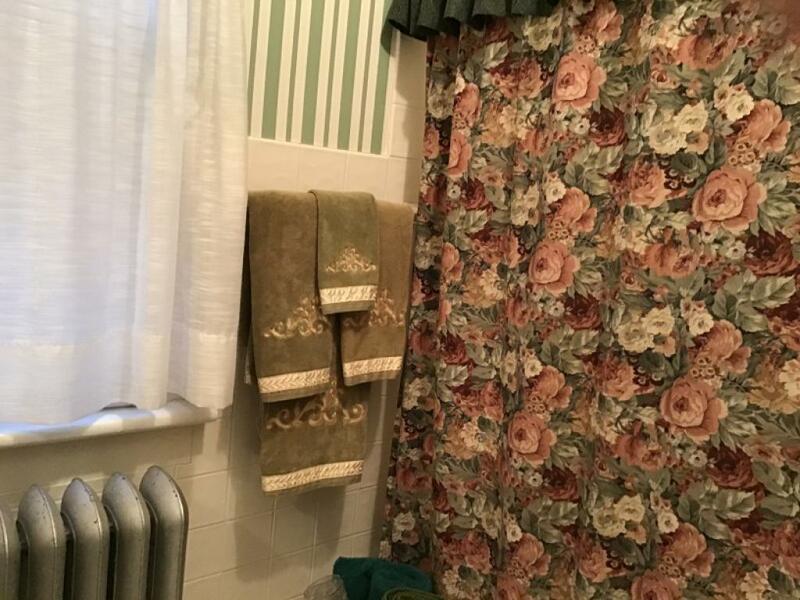 This room has a private bathroom with a shower. 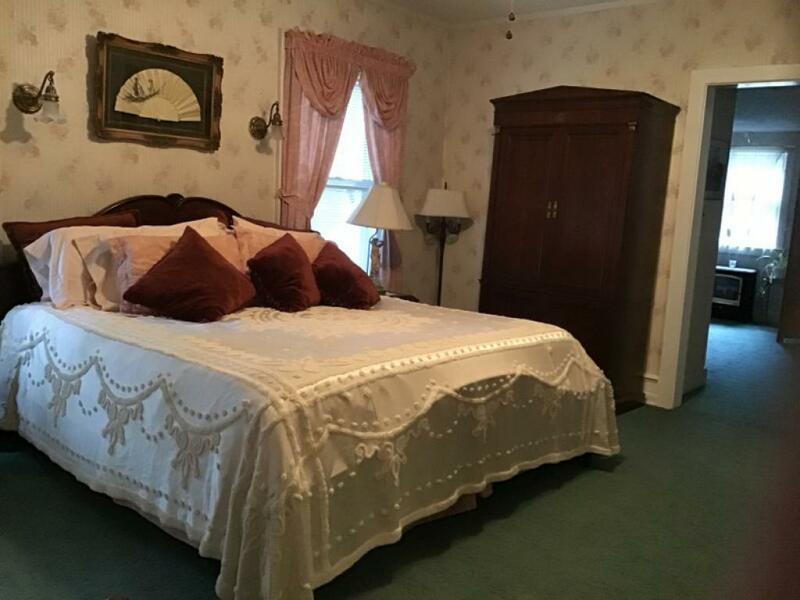 Room #10 Located on the second floor of the Carriage House, there is a queen-size bed with light pine headboard and foot board and an oversized armoire. The room also has a Flat Screen TV. 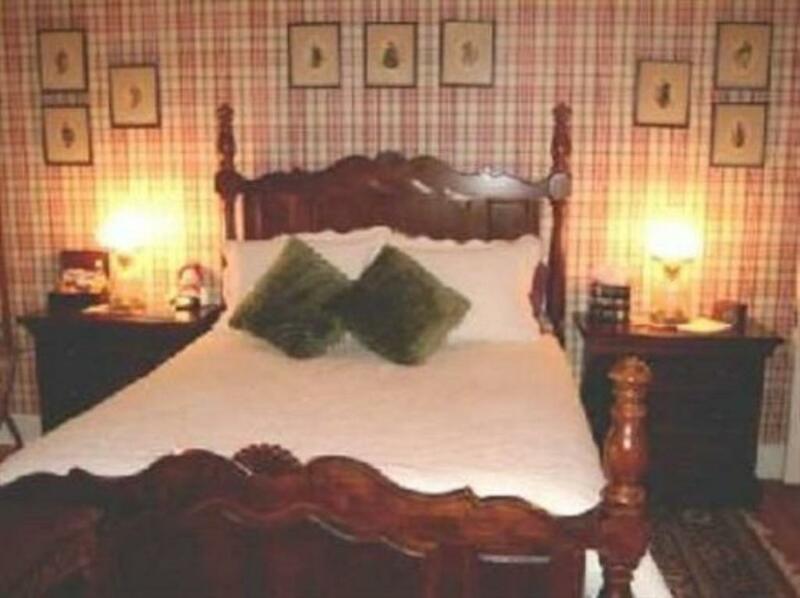 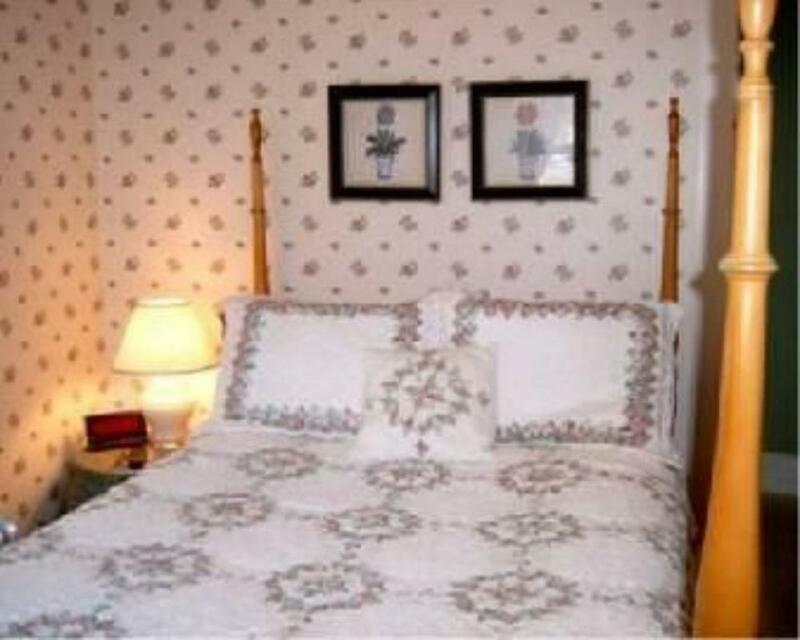 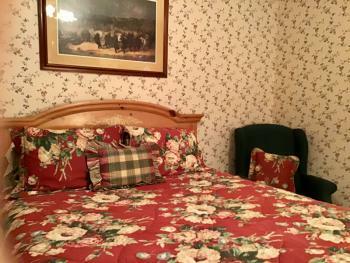 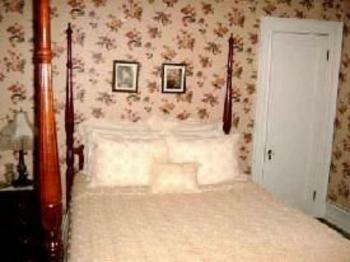 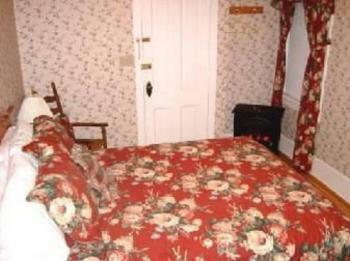 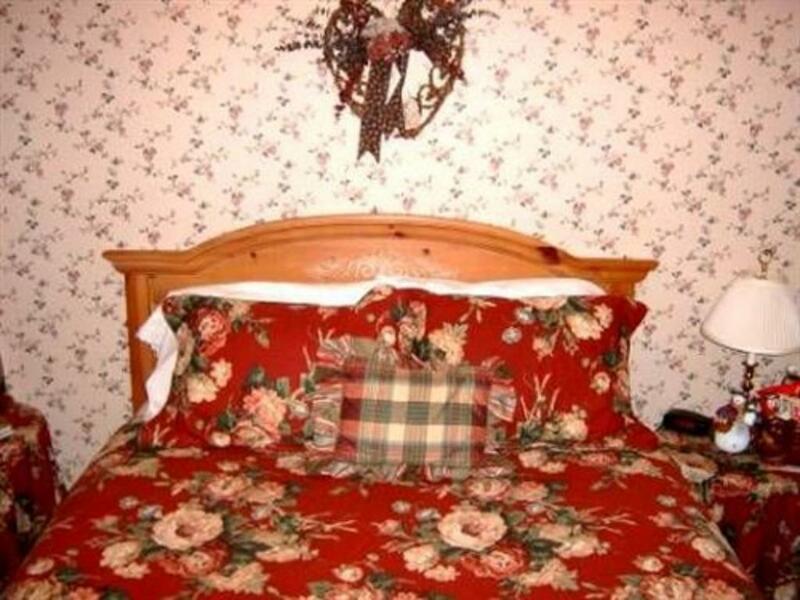 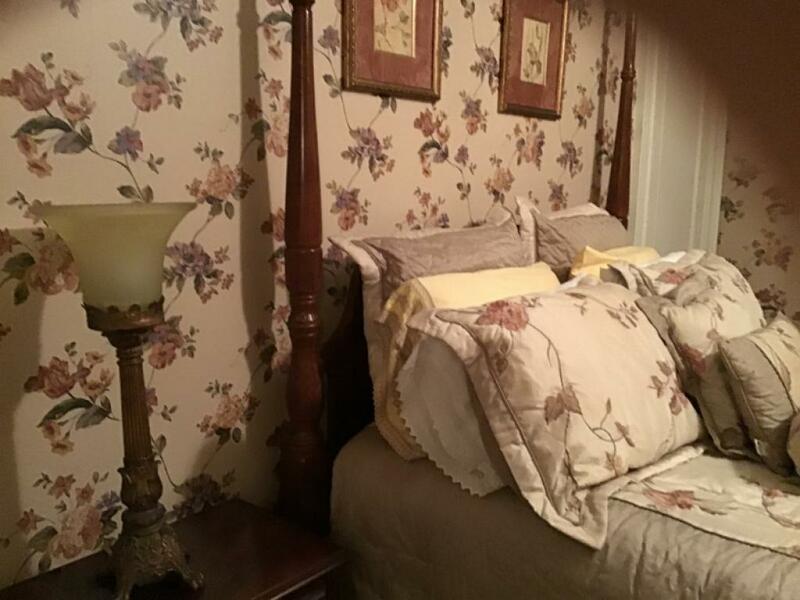 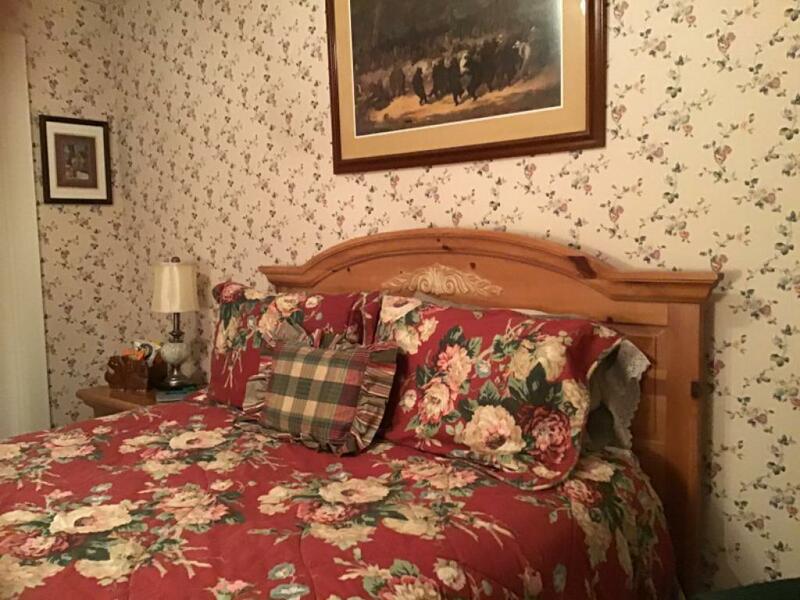 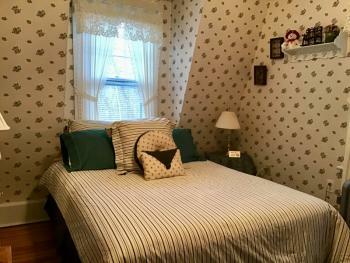 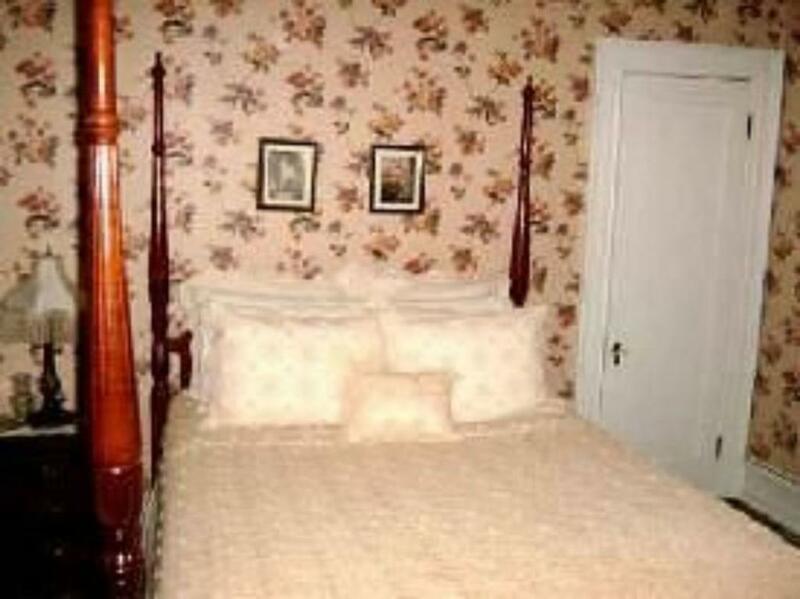 The room is accented with a dark red and green floral pattern on the curtains and comforter. 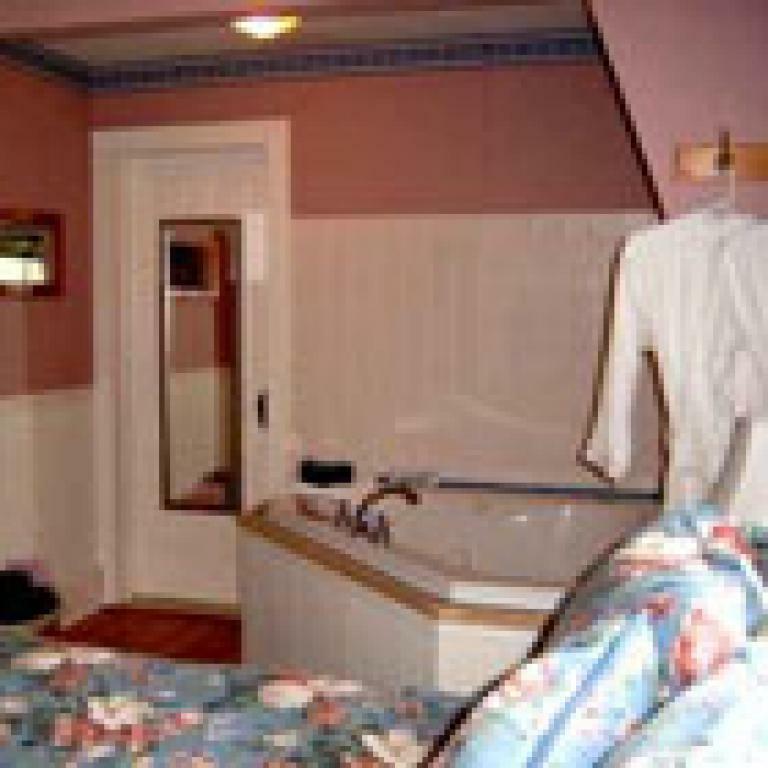 To add to the romantic mood, the bedroom also has a freestanding fireplace and the large bathroom boasts a whirlpool tub that lovingly fits two. 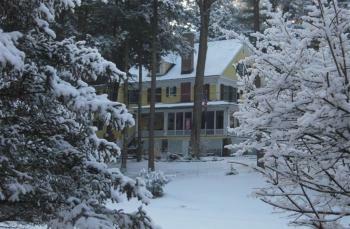 There are views of the forest and the barn from all windows. 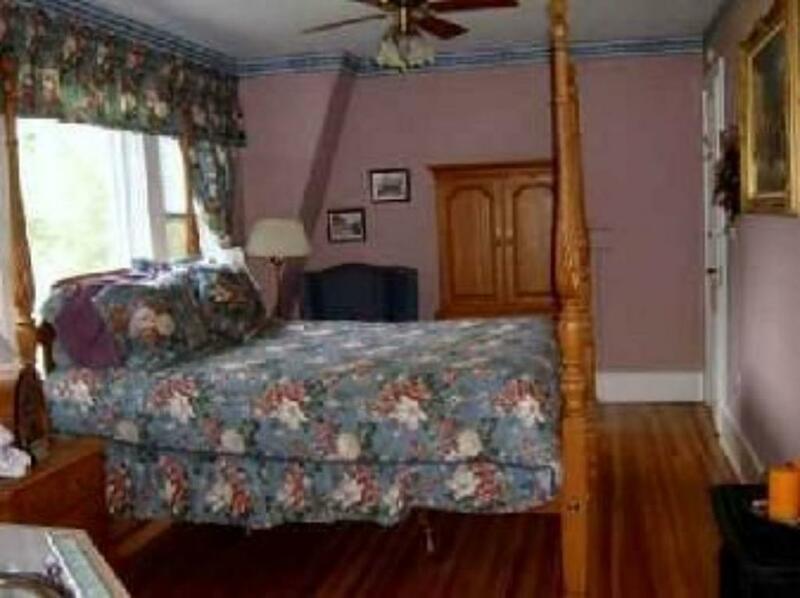 Room #11 Located on the second floor of the Carriage House this room surrounds you in beautiful blues and raspberry with its bouquets of cabbage roses adorning the bed ensemble and drapes. 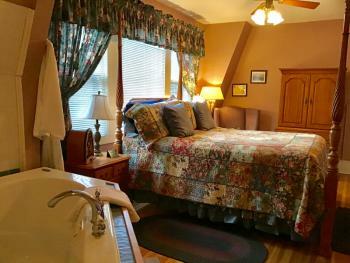 Centered in the room is a towering four-poster queen-size bed complete with steps and an oversized Jacuzzi whirlpool tub. 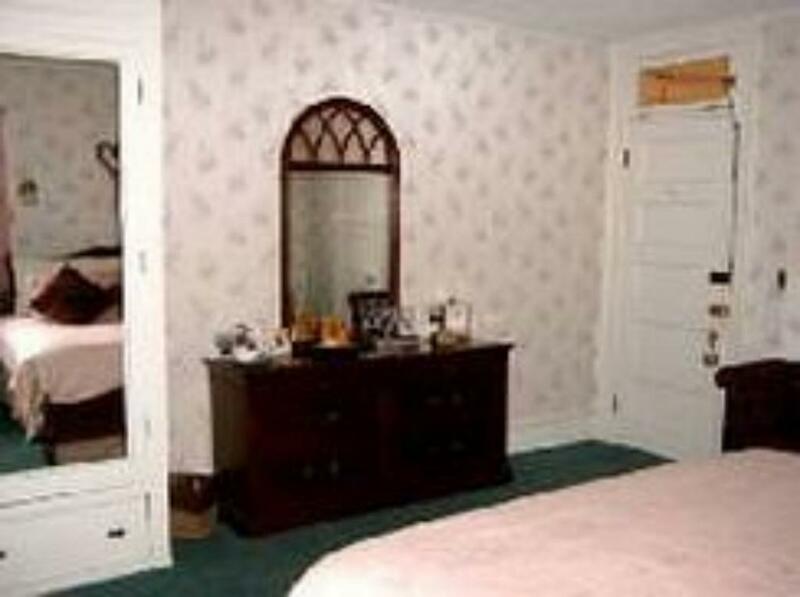 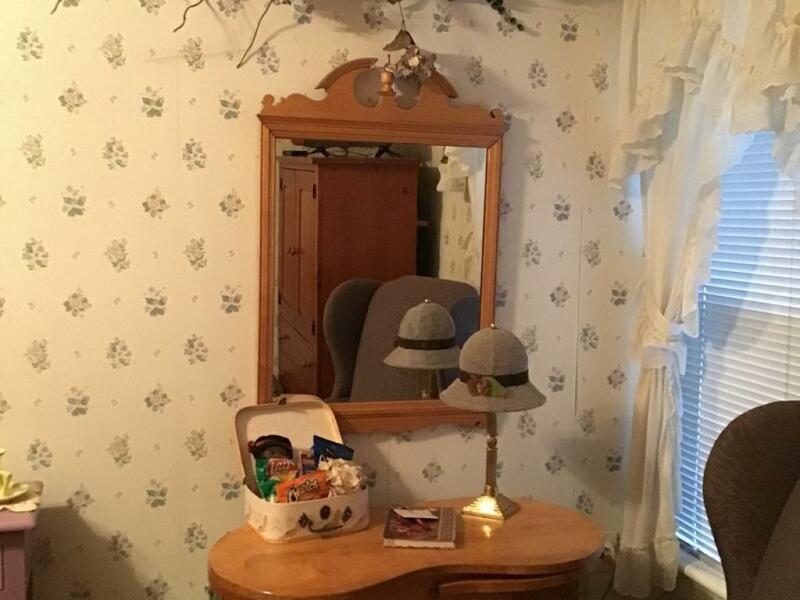 There are also matching nightstands and an armoire. 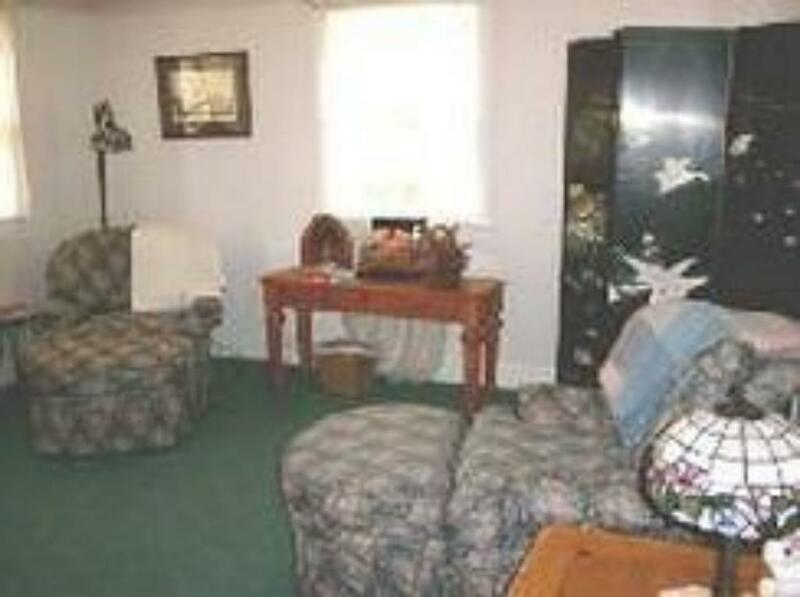 The room also has a Flat Screen TV. 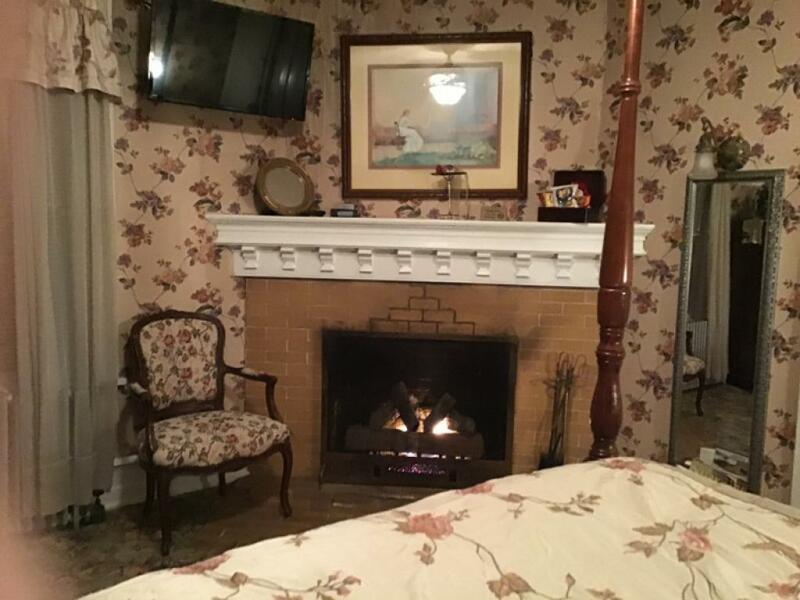 A freestanding fireplace competes for your attention with the views of the front lawns and the Brodhead Creek, from your picture window. 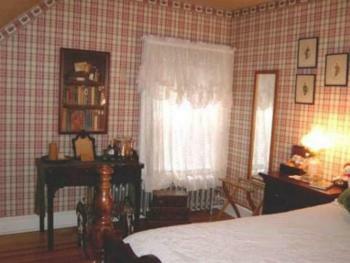 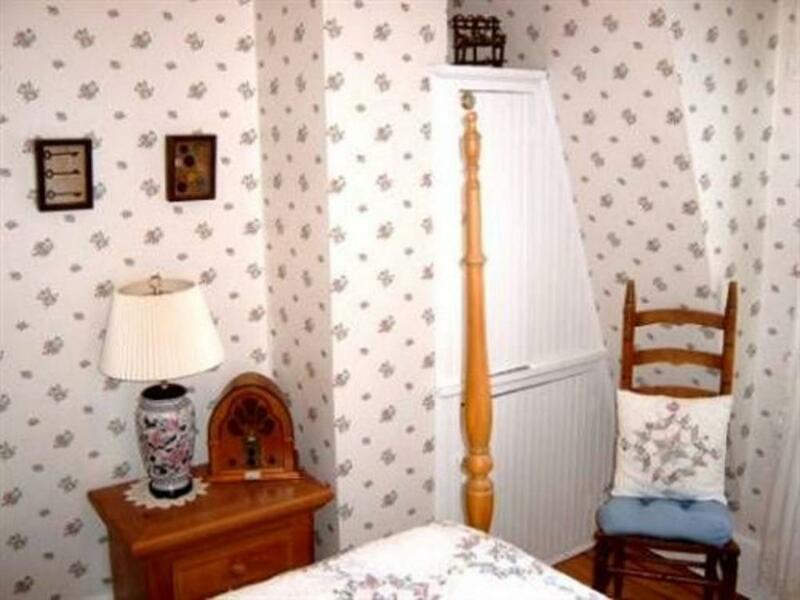 Room #9 Enjoy the charm of a cozy country-style cottage room. 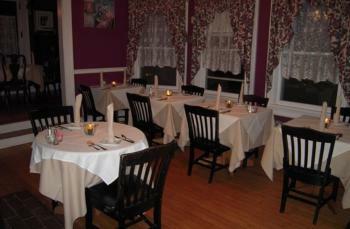 Room 9 is on the second floor of the Carriage House. Lay back, listen to the radio, watch TV or just relax on your queen size bed. 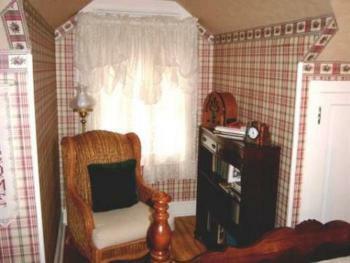 The dainty rosebud print wallpaper evokes memories of bygone days. The cottage ambiance is further enhanced with the white Battenburg lace curtains swaying in the breeze. 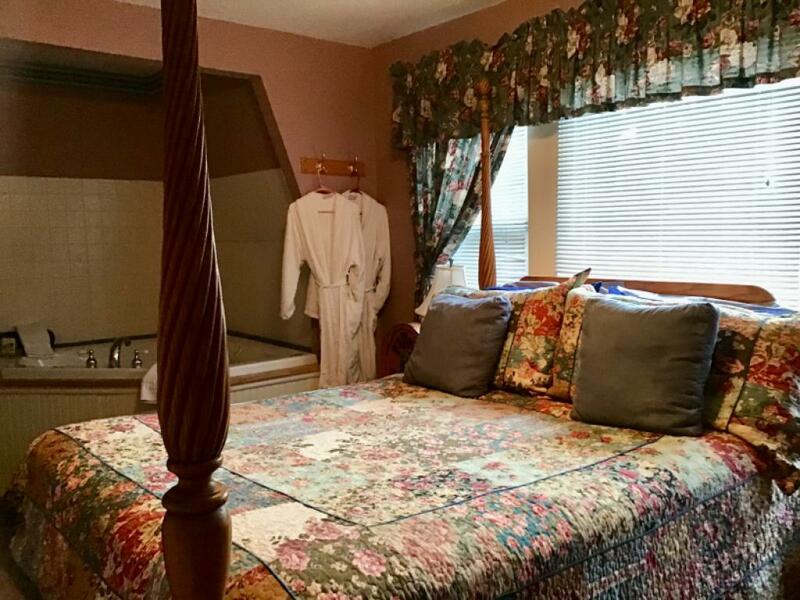 There are views of the Brodhead Creek, the front lawns and forest from your windows.There is also a free standing fireplace. The room has a private bathroom with a tub and shower. 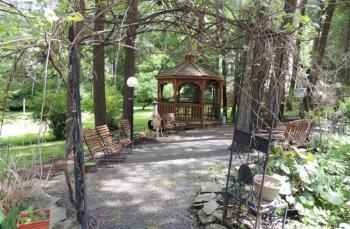 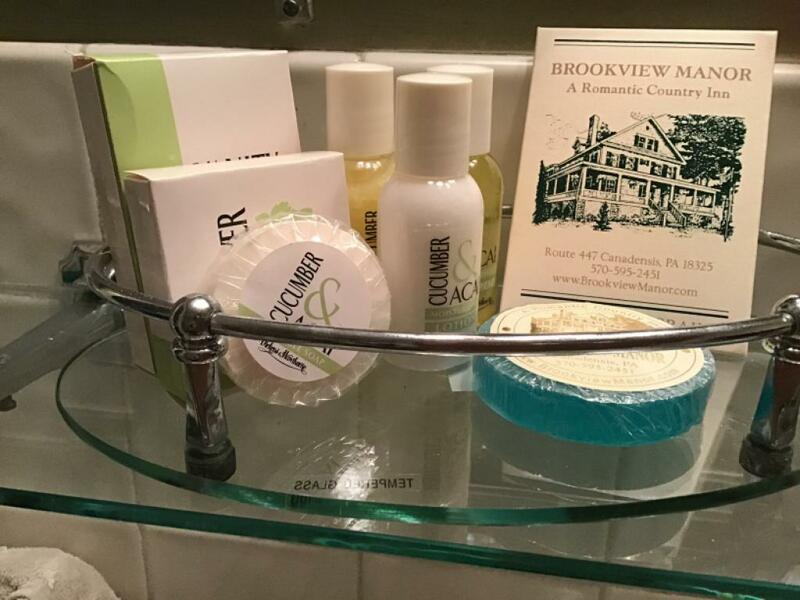 Nestled in the heart of the Pocono Mountains, Brookview Manor is situated on over five hilly acres across from the Brodhead Creek and is surrounded by over 200 privately owned acres of forests. 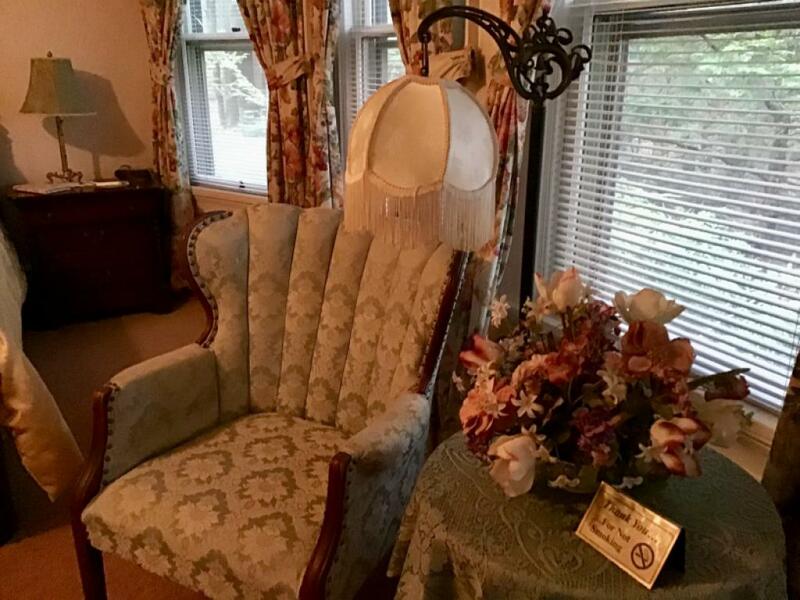 The Brookview Manor also boasts a 1,060 square foot wraparound porch with rocking chairs and what could be the county's largest porch swing. The first floor consists of a living room with a turreted lounge area that has a bar surrounded by three curved glass windows. 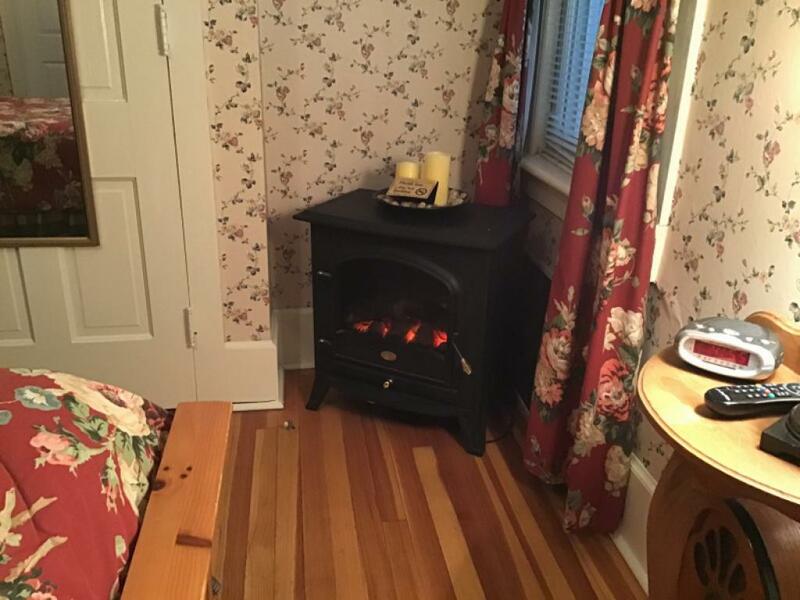 The first floor includes the library area that also has a fireplace and is a quiet nook to relax in. 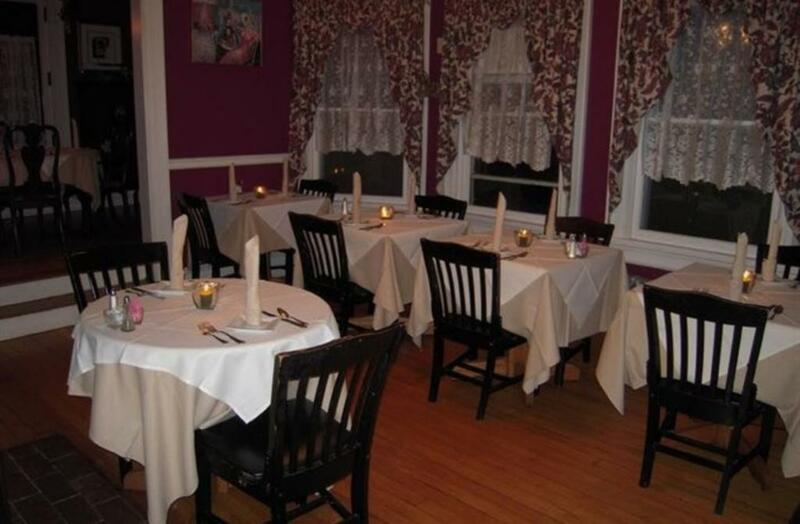 There are three adjoining dining rooms to choose from. 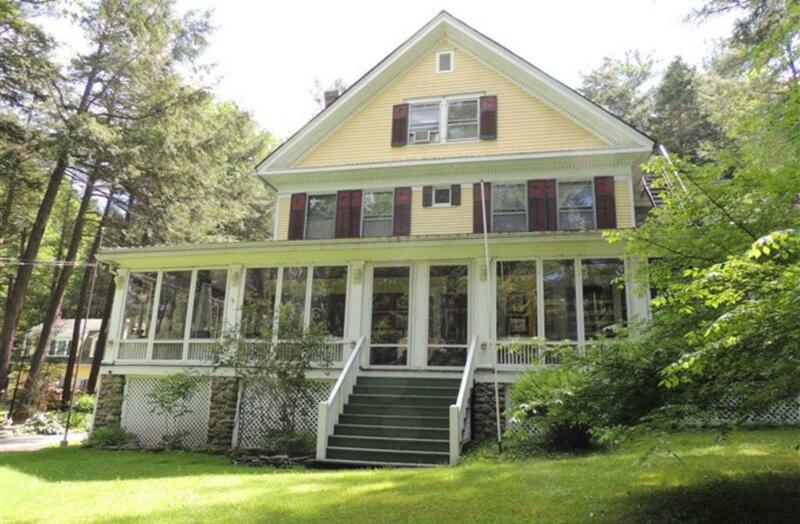 You may dine by the fireplace, on the enclosed sun porch or the raised formal dining room with two walls of windows with original stained glass, all with beautiful forest views. 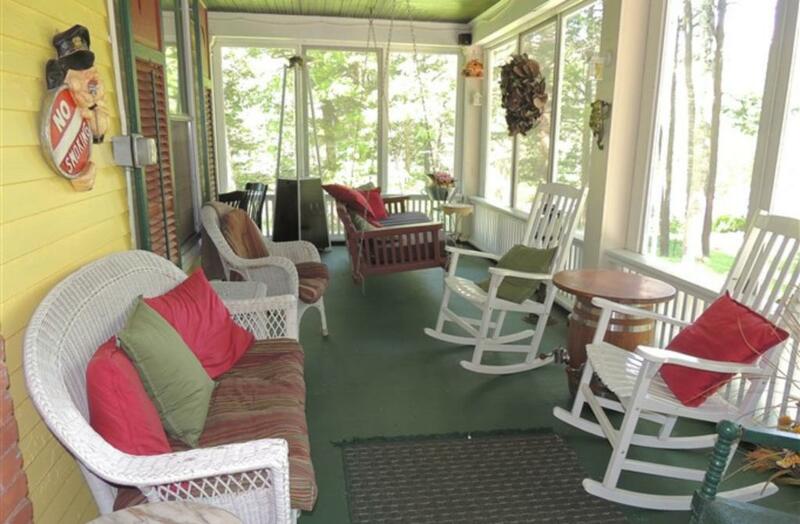 Our 3 season wrap-around porch can be enjoyed by all for dinning or just relaxing in rocking chairs with a glass of wine. 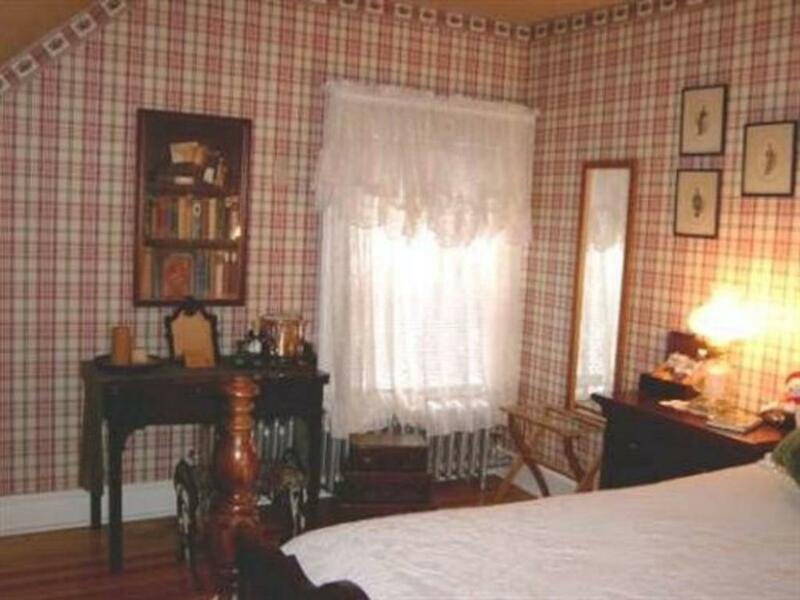 Herman's room, which has a fireplace, assorted games and Herman's home is a great place to unwind on a wing chair or enjoy a game of chess or checkers. 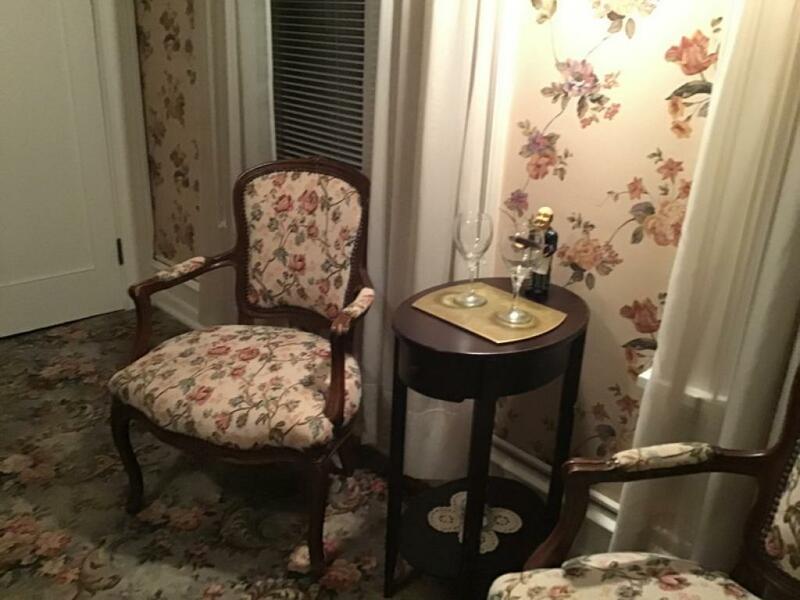 Herman's room is also used for private dining.